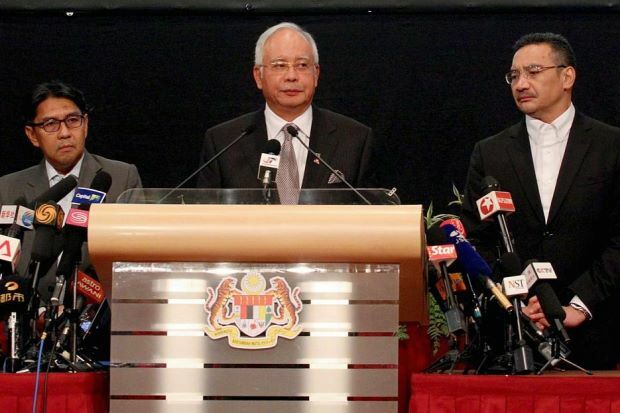 PETALING JAYA -- Prime Minister Datuk Seri Najib Tun Razak has announced that British investigators from its Air Accidents Investigation Branch (AAIB) have concluded that the flight of Malaysian Airlines MH370 ended in the southern Indian Ocean. He said that Immarsat, the company that indicated the plane flew along northern and southern corridors, have managed to trace its final flight path, using sophisticated technology. "Using a type of analysis never before used in an investigation of this sort, they have been able to shed more light on MH370's flight path." He said that MAS, together with AAIB, determined that MH370 flew along the southern corridor, and its last position was in the middle of the Indian Ocean, west of Perth. "With deep sadness and regret, that according to this new data, flight MH370 ended in the southern Indian Ocean," he said. He added that a press conference would be held Tuesday with further details on the latest findings. "In the meantime, we wanted to inform you of this new development at the earliest opportunity. We share this information out of a commitment to openness and respect for the families, two principles which have guided this investigation," said Najib.